As a child eclairs always amazed me. The first time my mom took me to our local bakery I spotted the eclairs through the shiny glass, beautifully presented on a mirrored tray. That day I wasn’t allowed to get one as we had gone there to pick up a birthday cake but my mom promised we would go back soon. I’ll never forget the morning my mom took me to choose my first eclair. I was excited to see if it would live up to my expectations. I imagined the eclair to be quite dense (as that is how it looked) and thought the glossy chocolate glaze would be sickly sweet. I couldn’t have been more wrong. I remember not knowing how to explain what I tasted but that I liked it. I remember savouring the light cream filling speckled with black seeds. Since that first encounter with the classic eclair, I have loved them immensely. And so, when my home economics teacher announced that we would be making eclairs in high school, I was beyond delighted. I had never thought that I would actually be making this delicacy and even though she warned us that it was a tricky pastry to pull off, I jumped in head first. 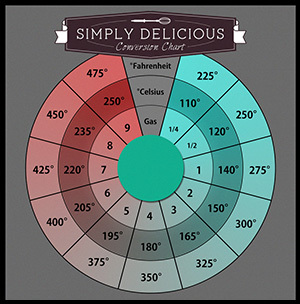 What you need to know about making eclairs is that the pastry needs to be handled as little as possible while still getting everything incorporated. All the ingredients need to be stirred in with a gentle but firm hand and should, under no circumstances, be over-mixed. Also keep in mind that there are a magnitude of ways of serving and stuffing eclairs. In High school we even made fish eclairs with a delicate smoked salmon and cream cheese filling. 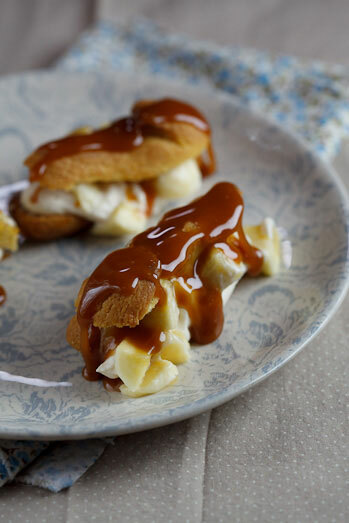 As salted caramel is so very popular at the moment (and rightly so), I wanted to use it in my eclairs. 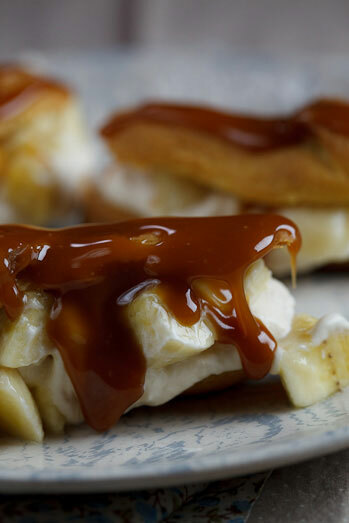 In my opinion, fresh banana is the only companion caramel ever needs and so I decided to use thin slices of banana with a salted caramel cream as the filling for my eclairs and kept some of the warm salted caramel to drizzle over the top. 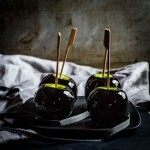 Absolutely decadent but oh-so-delicious! To make the eclairs, pre-heat the oven to 180c and line a baking tray with baking paper. Bring the water, cubed butter and salt to a simmer. Add all the flour and with a wooden spoon, mix until the dough forms a ball which pulls away from the sides of the saucepan. Allow to cool slightly and add the eggs one at a time, beating well after each addition. Pipe/spoon 12-15 x 5cm eclairs onto the prepared baking tray. Place in the oven and allow to bake for 30-45 minutes until the eclairs are golden brown and cooked through. To make the salted caramel, combine the sugar and water in a saucepan and allow to come to the boil. Cook until the sugar is the colour of Amber then add the butter and cream and stir until smooth. Add the salt and set aside to cool slightly. To make the salted caramel cream, beat the cream until soft peaks form. Whilst beating, add the warm salted caramel and beat until the mixture is thick. 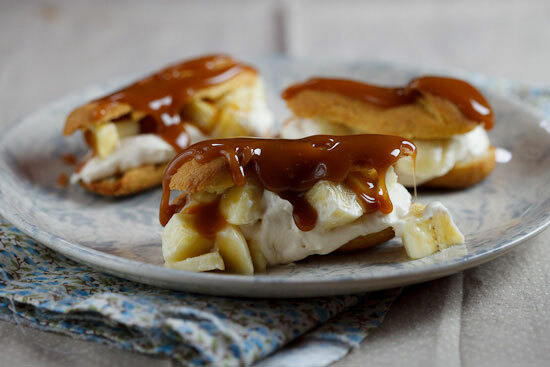 To serve, slice open the éclairs, spoon in some of the cream mixture, add some chopped bananas and a drizzle of salted caramel. 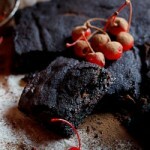 This recipe was developed for Woolworths for their Woolies Pantry for the duration of MasterchefSA. I am sure eclaires are a winner all round! 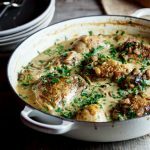 I love them – and they are not as difficult and daunting as so many think! 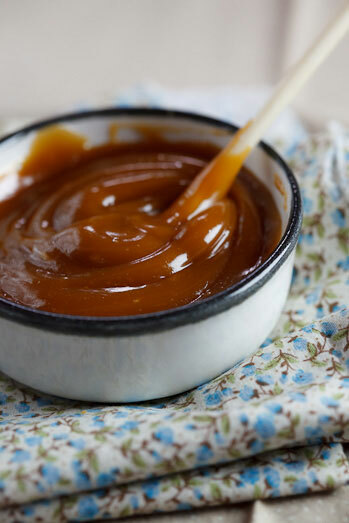 Your caramel sauce looks sooooo good! 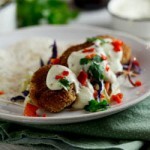 Those look devine! I made my very first batch of eclairs last week and was so pleased with how they turned out. 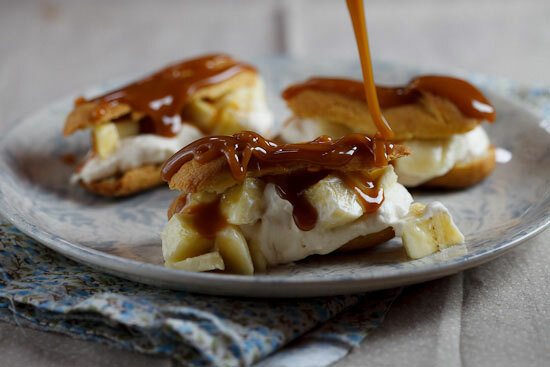 Will definitely be trying them with this yummy caramel topppin and banana filling! 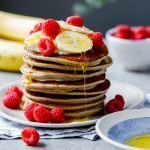 Is it possible to make the caramel without the salt? Cindy, yes of course. The salt just adds incredible flavour and does something magical to the caramel. Would you believe that I was just discussing eclairs with the hubby last night as choux pastry is a scary topic for me but its his birthday on the weekend and it would be a good oppurtunity to make it. Another thing that was putting me off is that the only recipe I have would make 40 and I wouldn’t want to quarter that recipe the first time I’m making pastry. So this post is perfectly timed. Thank you.